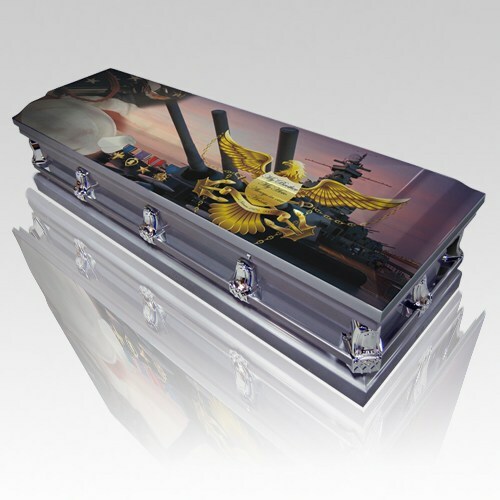 The Navy Military Casket is made from semi precious metal with a rounded brushed onyx finish. The inside is a grey velvet. The casket is a half-couch design. The interior also includes a matching pillow and throw. The exterior, meanwhile, is decorated with traditional corners, accessories and full handle bars. Customized Casket - NO Return. Ships Approximately 24-48 Hours after Ordering. FREE! Delivery in the United States. if you choose to have pictures on the casket. "This pendant is beautiful in every detail from the Mother of Pearl center, the Sterling Silver chain, the angel wing edges and even down to the personal message on the back. I bought this for my mother and she adores it. Thank you so much!"